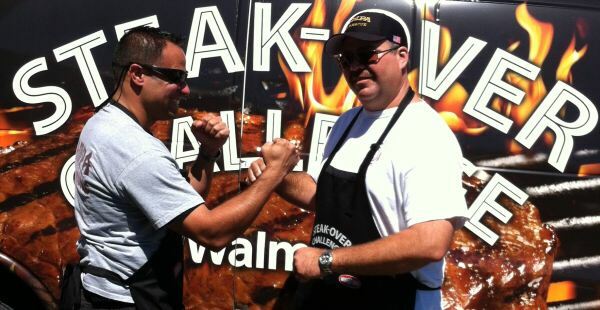 I stopped by my local Walmart the other day to check out the Walmart Steak-over Challenge where local firefighters compete to cook up the best steaks. I took my 2 young boys along because my wife was traveling that day, plus they love steak and firetrucks just as much as I do. I got to taste some great steaks, got a free sample of A1 Bold Original Dry Rub, and got to check out some firetrucks up close. Not a bad way to spend my Saturday afternoon with the boys. I also caught up with some friends from Kingsford, who were also sponsors of the event. As it turns out, Paramedic Sergio Leon from Station 8 narrowly beat Captain Gary May (Station 13) with his Classic Tampa Bay Rib-eyes. If you don’t have anything to do on the upcoming weekends, check out the Walmart Steak-over at your local Walmart. MORE INFO: Visit www.walmart.com/steak for steak-grilling tips and recipes from all participating firehouses.